Advance to Rice Lake’s Legend Series classic Rice Lake quality and design with new ideas for tomorrow. 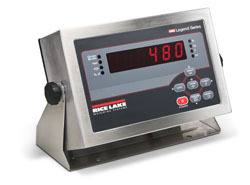 As the flagship of Rice Lake’s Legend Series, the 480 Digital Weight Indicator has been perfected to provide the very best in performance and value. With its stainless steel enclosure and advanced gasket system, the industrial-strength 480 Digital Weight Indicator is built for dirty, wet environments and demanding workplaces, inside or out. The advanced circuitry also withstands electrical noise, power disturbances and transient spikes that are common to industrial applications. Rice Lake’s 480 is the industry’s first choice for readability. With it’s large, ultra-bright LED display, 0.8-inch digits and sharp contrast, the 480 provides superior display visibility. Its six-button tactile keypad allows for quick navigation and programming. Connect the 480 Digital Weight Indicator to a printer, PC or remote display and make use of configurable print formats, time and date function, and local/remote capability. Whether it’s used in heavy capacity or batching operations, the 480 powers as many as ten 350 ohm load cells in parallel. Engineered with Rice Lake’s advanced digital filtering, the 480 Legend Series promises top speed without sacrificing weight stability.